To support local industries and discourage imports, the U.S. government imposed a 10 percent tariff on many Chinese goods in 2018. These tariffs were set to increase to 25 percent starting in January 2019, but have been delayed by 90 days after the U.S. president Trump met with Chinese President Xi Jinping in Buenos Aires. The tariffs are pending as the two countries are working out a new trade deal. How would these tariffs impact international trade? As we wait for an update on the status of these international tariffs, it’s important to keep your business prepared for any situation. 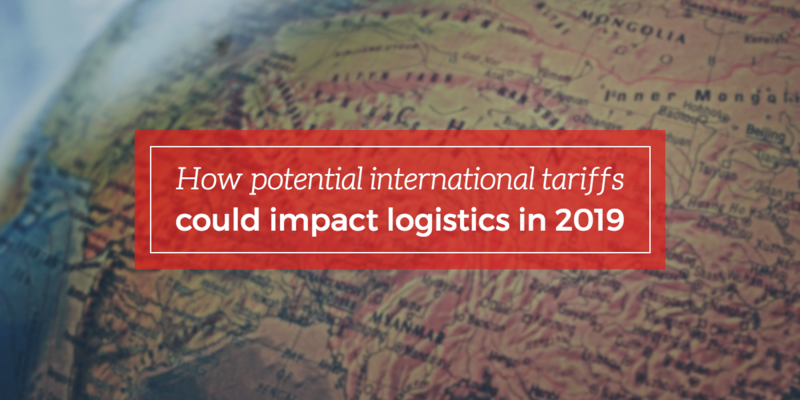 Here’s how international tariffs could impact your supply chain. If the tariffs pass and companies decide to stockpile Chinese goods into America, it would cause shipping volume to rise and lead to issues like port congestion and a lack of capacity in several modes of transport. According to JOC, a large number of shipping vessels leaving Asia are already overbooked and even steady customers are being shut out of their shipments. Many shippers will turn to non-vessel operating common carriers (NVOCCs) or freight forwarders for relief. These carriers have attempted to solve some of these issues by introducing expedited services from Asia, such as express services or single-voyage “extra loaders” to meet the unexpected surge in demand. Once the ships arrive in America, they face another challenge: securing truck capacity. As shipping volumes remain elevated, available truck capacity will remain tight, a situation that’s worsened by the ongoing driver shortage. Perhaps the most notable factor of high shipping demand is the spike in freight rates. In 2018, ocean freight prices between the U.S. and China rose by around 30 percent during Chinese new year. If the new tariffs were to take hold, it could amplify these rate increases or at least minimize the post-Chinese-new-year rate drop off. If companies choose to stockpile inventory stateside, they will want to store their goods in warehouses, which will make the race for warehouse capacity that much more competitive. This trend will be especially pronounced in the desirable areas around urban centers. Existing warehouses will struggle to adjust for this unexpected surge in shipping volumes, as finding real estate and building new warehouses takes time and money that many shippers don’t have. If the 25 percent tariffs do pass, here are the steps you can take to mitigate your risks, get important shipments delivered on time, and control costs. In a limited-capacity environment, it’s crucial to split shipments based on priority. Ship your most important cargo via air freight (which only takes a few days), and have the rest of the cargo transported using other options that cater to longer delivery timeframes. Although split shipments require two packaging lists and can have a larger initial cost, it can help save money later on by allowing companies to provide ample inventory levels, avoid late fees, and circumvent the busiest routes during the extended peak season. Because of rail’s higher cargo-to-driver ratio, using intermodal transport can help shippers get around issues like driver shortages and port congestion. Rail trains follow consistent schedules with limited stops between points, making them more reliable and transparent and simplifying the job of shipping managers in a tight market. Once your cargo arrives stateside, winning over truck drivers can help you secure enough truck capacity to deliver your cargo. To become a preferred shipper, make sure to recruit and retain quality drivers by being upfront about job expectations, offering competitive compensation, and showing employee appreciation through acknowledgments and recognition. If you outsource capacity, consider using contract rates to help both parties avoid the volatility and uncertainty of the post-tariff international spot rate market. To effectively address capacity challenges, it’s important to understand what’s causing them and learn smart tactics to overcome them. In our capacity e-book, we share the reasons why capacity has been so tight in the logistics industry and provide you with actionable tactics for finding more capacity while reducing your costs. Get instant access by downloading the ebook here.